Thanks to all who participated in Showbie’s #ShowbieAndTell Twitter Chat on Wednesday, December 5, 2018! 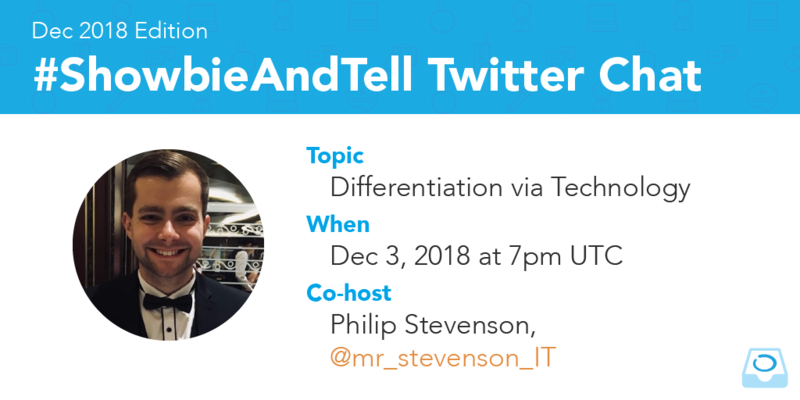 Showbie hosted a Twitter Chat with Showbie Champion Philip Stevenson around the topic of “Differentiation via Technology”. Below is a curated version of the Twitter Chat with Philip Stevenson. How has technology helped you with differentiation for students, and how has it fallen short? In what creative ways can technology be used to differentiate? What is an effective way of implementing differentiation via technology into schools? To what extent should technology be relied on to provide differentiation? Is it the most effective method? A2 – So… Children take pictures and then read their writing back to me – this helps me to access their writing but also develops their speaking and listening. A3 #showbieandtell sometimes with differentiation it is only certain groups that use the app. Sometimes it is with mixed ability pairs – one who is strong with content and the other to use the app.